Evan Mawarire speaking at the Oslo Freedom Forum Johannesburg. Photo by Oslo Freedom Forum. Mawarire’s video and more than 20 others that he posted in the ensuing weeks helped touch off a movement, centered around the hashtag #thisflag. The videos made him a national figure and led to his arrest on multiple occasions by Zimbabwean authorities in the months leading up to Mugabe’s dramatic removal from power in November of 2017. 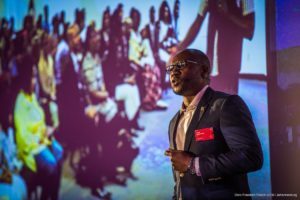 Not quite two years after posting his initial Facebook video, Mawarire was able to take the stage in Johannesburg, South Africa to share his story at the inaugural Oslo Freedom Forum in Johannesburg, an international gathering of activists, and allies from the worlds of technology, media and education that marks a new phase in the 10-year history of the Oslo Freedom Forum. The first Oslo Freedom Forum was organized by Venezuelan-born human rights activist Thor Halvorssen and held in the Norwegian capital in 2009. “The original idea was to get authors who had written testimonies of both the horrible things that humans do to one another and the incredible prowess of the human spirit,” says Alex Gladstein, who is chief strategy officer for the Human Rights Foundation, which runs the forum and its offshoots. The first Oslo Freedom Forum featured writers including dissident playwright-turned Czech president Vaclav Havel, Holocaust survivor and Nobel Peace Prize-winner Elie Wiesel, former Soviet prisoner of conscience Vladimir Bukovsky and Mao Zedong biographer Jung Chang. What was to be a one-time event celebrating noble purpose turned into an annual affair that The Economist would eventually dub a “Davos for dissidents” — an annual meeting for people doing similar work around the globe to meet, share ideas and plan new ventures. As the forum’s 10-year anniversary approached, Halvorssen and Gladstein approached the John Templeton Foundation — which had contributed funding for the first Oslo Freedom Forum — with a proposal for expansion. “We wanted to take the successful seed event in Norway and bring that experience to different cultures and different parts of the world,” Gladstein says. The resulting project is rolling out three regional versions of the Oslo Freedom Forum, to be held annually in Johannesburg, Taipei, and Mexico City. The new gatherings will be overseen by the Human Rights Foundation team including Halvorssen, Gladstein and Freedom Forum global director Jamie Hancock. Round-table discussions for leaders from the worlds of activism, business and government are also a key element of the global freedom forum concept. “When you get all the different companies, foundations, lawmakers and diplomats, you have all these people going around and putting forward their ideas of how they could make a difference in the struggle for human freedom,” Gladstein says. “It’s very inspiring, and hopefully also productive.” All three of the new regional forums will maintain a largely local focus (most of the speakers in Johannesburg came African countries, from Egypt to Swaziland) but with some cross-pollination to learn from activists working in other contexts. For his part, Evan Mawarire used his time in Johannesburg to launch his latest campaign. The morning after he spoke at the Oslo Freedom Forum in Johannesburg, he made another Facebook post from his hotel room—announcing he is running as a political independent for a spot on Harare’s city council. Having dealt with arrest and imprisonment, and played a role in the ouster of one of the continent’s longest-lasting dictators, the #thisflag activist now hopes to help secure clean water, pothole-free streets and a free media for his neighbors in his country’s capital. Learn more about the Oslo Freedom Forum and watch the highlights video for the 2018 Johannesburg edition of the conference. Watch Evan Mawarire tell the story of #ThisFlag and launch his campaign for Harare’s city council.